SNOBBY HIPPY: Merry Christmas! Joyeux Noël! Woohoooo! Merry Christmas! Joyeux Noël! Woohoooo! Cadillac a parrainé un concert de Noël avec un tas de célébrités pour chanter à <> à Los Angeles. Maintenant, c'est bon pour visiter pq les décorations sont toujours en place! 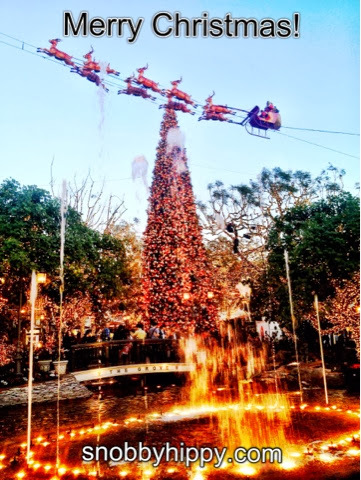 We spent Christmas Eve at The Grove in LA. A few years ago, they made it "snow" there. I think they show that on some episode with Lauren Conrad on MTV's "The Hills" (Go, L.C.!). This year, they had "A Hollywood Christmas," presented by Cadillac, and the place was decorated SOOOO beautifully to match!